We're seeing two major developments on the housing and mortgage fronts, and I want to make sure you know about them — and what they mean. At the end of last week, Federal Reserve Chairman Ben Bernanke delivered a major speech in Wyoming about the subprime mess and the housing meltdown. Bernanke acknowledged that the housing market is in awful shape, dropping the tiresome "well-contained" claptrap we've been subjected to. "The Committee continues to monitor the situation and will act as needed to limit the adverse effects on the broader economy that may arise from the disruptions in financial markets." This increases the chance the Fed will cut its benchmark federal funds rate as soon as September 18, when it next meets to discuss monetary policy. The funds rate is currently 5.25%. Keep in mind the Fed has already taken other steps to grease the markets' wheels. They include a half-percentage point cut in the discount rate on August 17 and a reduction in some fees related to borrowing Treasuries. President Bush followed up Bernanke's speech with his own mini-bailout plan for overstretched borrowers. Specifically, he announced moves that would make Federal Housing Administration (FHA) mortgages more attractive and available to homeowners having trouble with their payments. The FHA's guidelines will be modified so that adjustable-rate loan holders who fall behind on their payments due to a rise in rates can refinance into FHA loans. The rules currently prohibit borrowers who are already delinquent from doing so. FHA's credit standards may also be eased, and FHA loan limits (which cap the maximum size of FHA mortgages) may be raised. Let's say you bought a $200,000 house with no money down, and its value falls. You might negotiate a short sale with the lender that would allow you to sell the house for $180,000. You would use the proceeds to pay off that part of the mortgage balance, while the lender forgives the remaining $20,000. Right now, that $20,000 is typically considered income, and you'd pay taxes on it. The proposed legislation would eliminate that tax burden. This week, we got one of the worst housing reports in a long, long time. The National Association of Realtors reported that pending home sales plunged 12.2% between June and July. That's the worst one-month fall on record! The index, which tracks contracts to buy existing homes, stood at 89.9, the lowest since September 2001. That's right — the same month we suffered the 9/11 terrorist attacks. Now, this index doesn't track contract closings so it's a leading indicator. I expect closed sales to fall in August and September as a result of these dismal pending stats. We just learned that the share of loans on which lenders began foreclosure proceedings climbed to 0.65% in the second quarter, according to the Mortgage Bankers Association. That was up from 0.58% in the first quarter and the highest level in history! The MBA has been tracking the market since 1972. Some 5.12% of the country's mortgages are also now delinquent, meaning the borrower is at least 30 days behind on payments. That's the highest in five years. Things are the worst in the subprime market: A whopping 14.82% of those loans to borrowers with bad credit are being paid late, up from 13.77% a quarter earlier and the second-highest amount on record. First, home prices are declining in many parts of the country. A quarterly home price index compiled by S&P/Case-Shiller, for instance, showed prices declined 3.2% year-over-year in the second quarter. That was the worst decline since the firms started collecting data in 1987. As a result, more mortgage holders are upside down, or owing more than their homes are worth. Those borrowers have an economic incentive to resort to "jingle mail" — sending their keys back to their lenders and walking away. Second, mortgage lending standards started tightening up earlier this year. That's made it tougher for stretched borrowers to refinance. And this trend has only accelerated since the second quarter ended, meaning we'll see even more pressure on borrowers in the coming quarters. Third, for-sale inventory has skyrocketed. We now have a whopping 4.59 million single-family homes, condos, and co-ops on the market, according to the National Association of Realtors. That compares with just 2 million to 2.5 million in the late 1990s and early 2000s. We have a longer history of data in the single-family-only market, and the numbers there are equally grim. It would currently take 9.2 months to sell all the single-family homes on the market , assuming the sales pace remained constant. That's the worst reading since late 1991. With so much supply out there to compete against, borrowers who can't pay their mortgages are behind the 8-ball. They can't sell to get out from under their obligations. 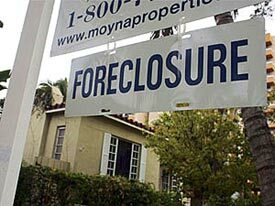 As a result, more end up tumbling into foreclosure. I wouldn't be surprised to see even more government bail-out efforts launched. We're already seeing regulators bring greater pressure on mortgage servicers, the companies that collect payments and otherwise oversee existing mortgages. Officials want servicers to proactively contact borrowers who face adjustable-rate mortgage (ARM) and payment resets. They also want them to look at ways to ward off future delinquencies. Companies are being encouraged to do more loan "modifications," for instance. That's when the servicer changes existing ARMs into fixed-rate loans, extends loan maturities, lowers interest rates, or otherwise takes steps to ease borrower payment burdens. We could also see restrictions eased on Fannie Mae and Freddie Mac, allowing them to buy larger loans. Beyond that, who knows? You can bet that Congress and the administration will continue to devote a lot of time and effort to the housing market's problems. You can also bet that Fed policymakers will throw as much money as they can at the problem. Unfortunately, as Larry and some of my other colleagues have pointed out, that will ultimately devalue our dollars, with all the attendant problems that brings about. It's also bullish for gold — if you didn't see it already, the yellow metal surged to the $700-an-ounce level yesterday, its highest point all year. As for the impact of these government bailout plans on housing, I'll say this: Given the magnitude of the market's problems, the efforts to date won't be enough to make a major dent. I'm sticking by my prediction that we won't see a longer-lasting housing recovery until at least the back half of next year, or even 2009 if the economy slips toward recession. and that also includes anymore massive fed printing in order to "stabalize markets"